Background: Nitrogen (N)-doping in the graphene lattice is a process to tailor the physicochemical properties of graphene nanosheets, and explored for potential use in the various modern applications. Objective: Synthesis of N-doped graphene nanosheets via green route in contrast to the post traditional harmful methods. Method: N-doped graphene nanosheets have been synthesized by simple solvothermal method at 180 oC using cow urine as a natural dopant of nitrogen. Results: Experimental results confirm that the cow urine has deoxygenated the graphene oxide to produce graphene nanosheets, and simultaneously nitrogen atoms are successfully doped into graphene lattice from cow urine. The current approach produces high yield N-doped graphene nanosheets with N content ~ 3.2 at.% into the graphene lattice. 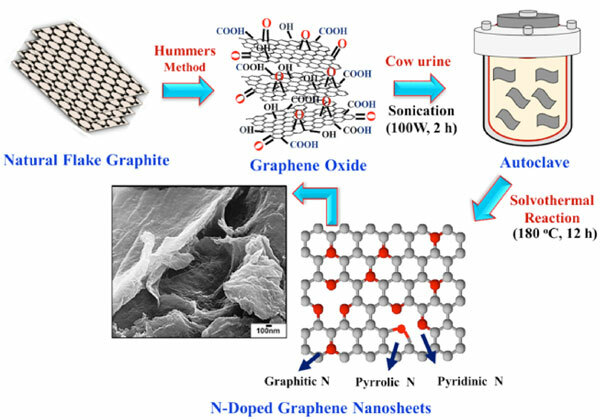 Conclusion: A strikingly simple, cost effective and environmental friendly approach has been demonstrated for the synthesis of N-doped graphene nanosheets by simple solvothermal method using cow urine as a natural dopant of N atoms. The proposed approach produces N-doped graphene nanosheets at bulk scale. Keywords: Graphene, nitrogen doping, N-doped graphene, cow urine, green dopant, solvothermal method. Keywords:Graphene, nitrogen doping, N-doped graphene, cow urine, green dopant, solvothermal method. Abstract:Background: Nitrogen (N)-doping in the graphene lattice is a process to tailor the physicochemical properties of graphene nanosheets, and explored for potential use in the various modern applications. Objective: Synthesis of N-doped graphene nanosheets via green route in contrast to the post traditional harmful methods.